When you think back over your past, who has had the greatest positive influence on you? Now keep that person or those people in your mind as this post continues. I have a point to make. The greatest influencers, leaders, and managers are those that motivate people from within--by intentionally placing courage inside of those people. How does one place courage inside of someone? 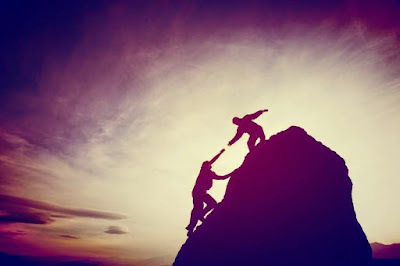 Encouragement = "the act of [placing] courage inside of [someone]"
After all the boring word study and dictionary stuff, there's a clear application here--you can be an encourager. And not only can you be, you should be. Why? Because someone encouraged you, giving you a chance to achieve your goals and attain the level of success you enjoy. You didn't do it alone. Recently I began reading a book called "Be a People Person: Effective Leadership Through Effective Relationships" by John C. Maxwell. I'm not very familiar with him or his work, but I do like the chapter I just finished. In fact, I stole the title of this post from that chapter! Because somewhere in my head I have the crazy idea that I might be able to provide a unique angle on this topic. I like encouraging people. I like watching their potential manifest itself into reality. In Maxwell's book, he says, "The key to encouragement is in knowing what gives people courage, what spurs them on to action. Too many of us take pleasure in discouraging people by pointing out their mistakes and getting excited about their failures rather than focusing on their strengths and getting excited about their possibilities." The first thing that caught my attention in this quote is the word "knowing." Knowing stuff requires work--a specific type of work called studying. Studying books is work, but so is studying people. If you're going to be an encourager, you need to become a student of people. You need to care about people. You need to notice how your words and actions affect people, then act accordingly. This quote also reminded me of a Bible passage in which Jesus harped on the same issue. [Jesus said] Why do you see the speck that is in your brother's eye, but do not notice the log that is in your own eye? Or how can you say to your brother, 'Let me take the speck out of your eye,' when there is a log in your own eye? You hypocrite! First take the log out of your own eye, and then you will see clearly to take the speck out of your brother's eye. It seems Jesus was aware of the fact that people tend to notice the shortcomings and failures of others and take time to point them out, sometimes publicly. But whether publicly or in the privacy of your own thoughts, you have the choice whether to spend your time and energy focusing on the bad in people, or on the good. When you read Jesus' words, with whom do you identify? Are you the log-carrying critic, or the splinter-carrying recipient? I'm both. And I bet you are too. At any given moment we can take on either role. But what is the log? Is it a giant moral failure? It is a glaring inconsistency in our life? Is it reckless behavior or despicable speech? I don't think so. I think the log is pride. Pride makes us a critic. Pride makes us blind to our own failures and weaknesses. Pride makes us bold enough to ramble on and on about the mishaps of others while simultaneously paving the path to our own ultimate demise. See, pride leads you somewhere; and you won't like it. I'm not trying to preach a blog-sermon, but I am pointing out that the reason why you and I often struggle to encourage others is because we're too busy criticizing them because of our pride. We're too busy carrying a log around. One of the systematic principles I learned about in my scientific studies is that of feedback loops. These little gems have been implemented in electrical engineering, software development, and many other disciplines; but first and foremost they operate in every multicellular creature on planet earth. There are positive feedback loops, in which the product of the loop also stimulates initiation of the loop. Example: Oxytocin in the birth process. Cells in the cervix feel pressure from the head of the baby. Pressure induces these cells to produce oxytocin, which circulates in the blood and causes uterine contractions. These contractions push the baby into the cervix, causing it to release more oxytocin; and the process goes on and on until the birth is complete. The point is that the signal (oxytocin) creates a result (uterine contractions) that further stimulates the signal (oxytocin). Let's jump back to the encouragement stuff. The signal (encouragement) creates a result (success) that further stimulates the signal (encouragement). Don't you feel good when you succeed? Of course you do. So it's a positive feedback loop. The signal (discouragement) creates a result (failure) that further stimulates the signal (discouragement). The question is, which signal are you sending? Which feedback loop are you initiating in other people? Maxwell goes on to say, "You don't get [from people] what you hope for, ask for, wish for, or beg for. You get what you reward." If you find peoples' behavior unpleasant or counterproductive, your best course of action is to encourage them and reward them if and when they behave or act in a way that is good or beneficial. This is pretty basic stuff, but I feel it needs to be said. I'm talking about gifts here--money or material items. It's so painfully practical, but it works. I'm not talking about bribing people or coercing them with payoffs. I'm talking about giving to them purely out of the desire to help and encourage someone because you want them to succeed. Perhaps you can give money, or maybe you just have something they need; so you can give it to them. It's that simple. Matthew 5:42 [Jesus said] Give to him that asks you, and from him that would borrow of you, turn not away. Let's take it a step further, and give to people even if they don't ask. 2. Recognize and appreciate people. This is free (except perhaps the cost of a card). Every now and then, verbally or textually acknowledge a person's contribution to the congregation, family, company, or organization. Let them know you notice them, and you appreciate what they're doing. Tell them they did a good job (even if it wasn't perfect). Or if they didn't do a good job (which happens), tell them you're glad to have them and you see good things in them. As a personal note, I was a punk kid. Sometimes I'm still a punk adult, but that's not relevant at the moment. As a punk kid, I remember a guy telling me, face to face, "Dan, you're a good kid; and I know God has great plans for your future." I don't remember that guy's name. I haven't seen him in fifteen years, but I remember how it made me feel. It surprised me, because I knew how stupid and rebellious and undisciplined I was; but he took time to let me know that he saw something good in me. I'm not saying he changed my life, but other people like him took it upon themselves to say similar things to me over the years. That encouragement is a great part of all my achievements (which aren't that many, but there are some). 3. Say kind words to people. I realize this overlaps with #2, but it's distinct in its emphasis. This point focuses on spoken words. The old adage, "Sticks and stones may break my bones, but words will never hurt me" isn't true. Depending on the context and the relationship, your words can literally break people. Maybe one word won't break them all at once, but each set of hostile words can broaden the cracks in a person's courage; then one day their courage and morale is nothing more than rubble. This applies to every aspect of life, from parenting small children to being CEO of an international corporation. For every ten negative things you can think of, you might be able to find one positive thing. So say that one thing and shut the ten negative things up. Yes, it's your grandmother's advice. But did you listen to it? I'm like you. Saying nice things is hard. It doesn't come naturally to us. But neither did typing, or shooting a basketball, or learning to ride a bike. It took a concentrated effort. It took practice. And now look at you--you can probably do at least one of those things pretty well. If not, I bet you know how to stalk people on Facebook. Think of all the practice that went into that skill! The world as we know it is comprised of people. We will spend a few years on this earth, and then we'll be gone. The impact you have will be determined by how you influenced people. Did you help people become successful (at good things), and in turn improve the world? Or did you incite discouragement, negativity, criticism, and pride?